TOUGH: Extra thick military grade braided steel loop coated in plastic for maximum strength. When ends are secured correctly in clasp, it can hold over 50lbs of weight. DURABLE: High quality thick PVC will last for day to day use for any labeling needs and multiple vacations or cruises. When used properly will last for years to come. PEACE OF MIND: Unique double zip seal keeps your documents safe and dry in wet weather. Tough and durable PVC will keep your documents in place and prevent them from getting lost. PERFECT FIT: Works for Carnival, Princess, P&O, Norwegian, Costa, and Holland America cruises. Great if you cruise one or multiple cruise lines. DIMENSIONS: 6.5 inches by 3.5 inches. 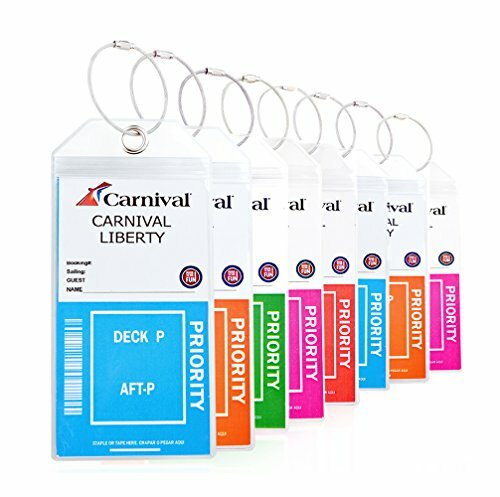 Designed for the convenience and ease of print at home paper luggage tags and boarding passes. If you have any questions about this product by TRS Tags, contact us by completing and submitting the form below. If you are looking for a specif part number, please include it with your message.